The concept behind the Hill Country Science Mill was single-minded: fascinate and educate young people in a limited amount of time about science, engineering, technology, and math – enough to activate an interest in science-related careers. Perfect Prototype was invited early to the planning process to advise on how augmented reality (AR) technology – an expertise of Perfect Prototype – could help execute that concept. Perfect Prototype imagined, then created a museum-wide system of augmented reality stations that links experiences at select exhibits to career options. At those exhibits, young visitors hold up their museum passes to an AR-coded tablet. An animated robot avatar that they had personalized comes alive and talks with them about what they had just learned at the exhibit and how they can find out more through the museum’s website and programs. Tracking visitors’ favorite exhibits for use later on the website when looking for career information on the portal. More than 30,000 visitors have used the augmented reality system in the museum’s first 10 months of operation. There were no calls to Perfect Prototype for technical support. Since the first install, the Science Mill has come back to Perfect Prototype to update their museum system. This new system allows users to pick between either the original avatar or an avatar that has their face! Perfect Prototype also completely overhauled the back-end and created a custom content management system so the museum can control all information on the tablets at each station. 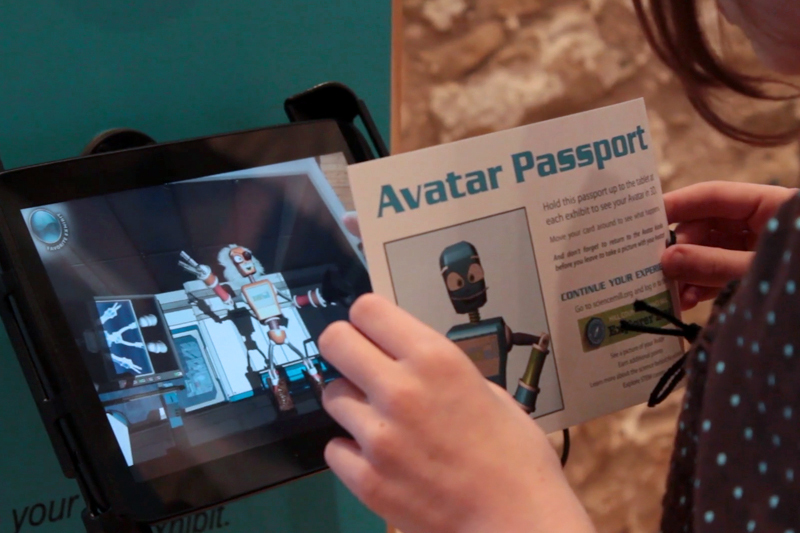 Scan your unique code at each exhibit to see your avatar animated, explore fun facts, see videos, and more! Scan your code to earn digital badges - can you collect all six?